There it hangs, unspooling from the dark, metal rafters of the Verizon Center in downtown Washington, D.C., as inspiring as ratty undergarments pinned to a long-forgotten laundry line. The banner is trimmed in orange and blue. It sports the wavy, telephone psychic-inspired logo of the Washington Mystics. In large block letters, it reads: "2002 WNBA ATTENDANCE CHAMPIONS." 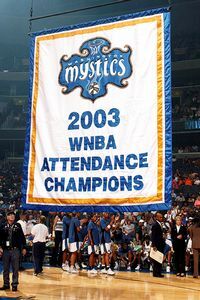 For good measure, there's another that reads "2003 WNBA ATTENDANCE CHAMPIONS." The Lincoln Memorial it ain't. A Michael Jordan statue outside Chicago's United Center. The New York Yankees' Monument Park. The sports world is rife with totems celebrating athletic excellence, such as the 17 Boston Celtics championship standards displayed at Boston's TD Garden. Then there's the other stuff, such as the "Colorado Rockies 1995 Wild Card Champions" mural that used to adorn the Coors Field outfield wall and the "OAKLAND RAIDERS WORLD CHAMPIONS" flag that still flies at Oakland-Alameda County Coliseum. Never mind that: (A) the Raiders last won a Super Bowl 26 years ago; (B) the team was based in Los Angeles at the time. 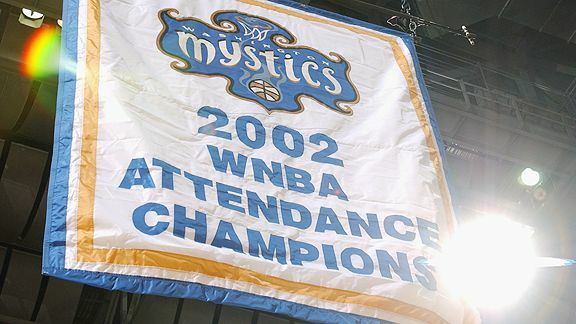 There are also the Mystics' attendance gonfalons, which we submit as the most ridiculous celebratory items displayed in any North American sports venue -- nay, the lamest sports banners on the planet. Here's where you come in: Page 2 is looking for the lamest banners in sports, and we want your nominees. The ground rules? No homemade banners. No fan stuff. The flags have to be sanctioned by a team or organization in some fashion. They have to be official, something raised for posterity, something put up out of pride -- no matter how ill-advised. As for what qualifies as lame? It's a lot like the Supreme Court's classic definition of obscenity. You know it when you see it. Ready to play? Upload your photos here. We'll choose and rate the winners -- note: term used loosely -- in a subsequent article. Location: Alltel Arena, North Little Rock, Ark. Lameness quotient: Astronomical. The RimRockers may be kings of the world, but it's a circumscribed world that does not include: (A) the NBA; (B) FIBA or the Olympics; (C) the original, professional-grade ABA of Dr. J, Larry Brown and Terry Pluto; (D) proper punctuation and/or a working space bar. 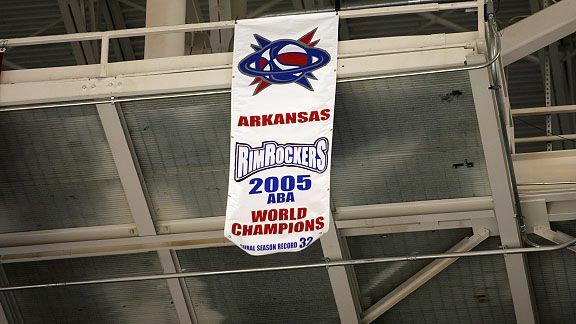 Fun fact(s): The world-champion RimRockers unveiled the banner before their inaugural D-League game, which they promptly lost; the franchise folded after two seasons in the D-League. filling seats? Say it ain't so! Fun fact(s): The NHL consecutive sellout record is 487, set by the Colorado Avalanche from 1995 to 2006. 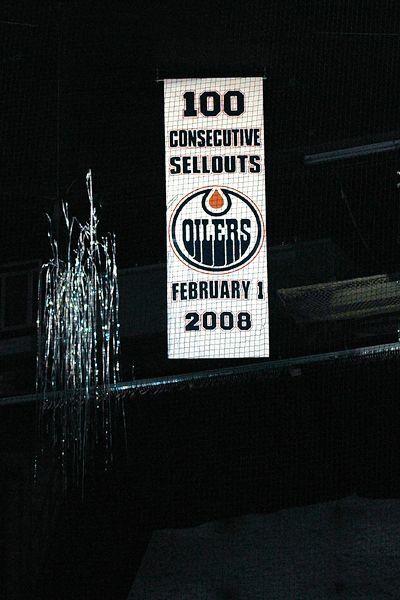 If the Oilers break the mark, perhaps they can hold a victory parade. Lameness quotient: Retroactively high. Much like this Sports Illustrated cover. 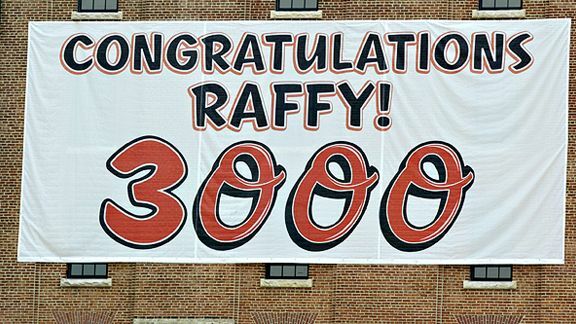 Fun fact(s): After the unveiling, Baltimore lost its subsequent game to the Chicago White Sox; the banner wasn't called to testify before the House Committee on Oversight and Government Reform. Location: RBC Center, Raleigh, N.C.
Lameness quotient: High. Really? A banner for making an All-Star team? Does the immortal Rick DiPietro deserve a flag, too? 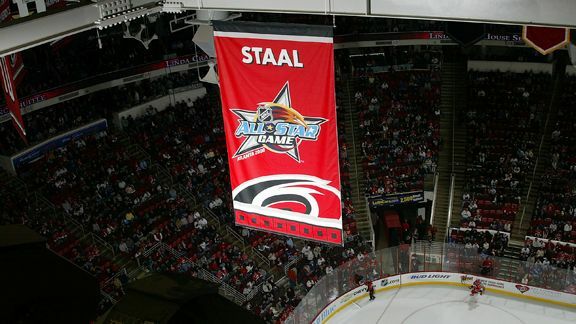 Fun fact(s): Staal was named MVP of the 2008 All-Star Game. More banners! Lameness quotient: Moderate. 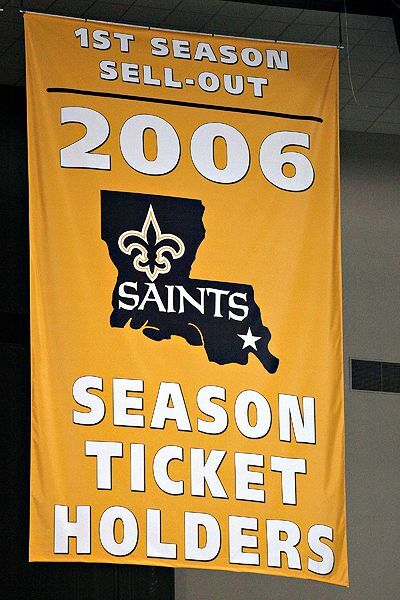 On one hand, the Saints became a symbol of civic pride and renewal after Hurricane Katrina; on the other hand, raising a banner for selling tickets to football games is like a car dealership hoisting an enormous, sun-blocking flag reading "EXCEEDED 2009 SALES QUOTAS." 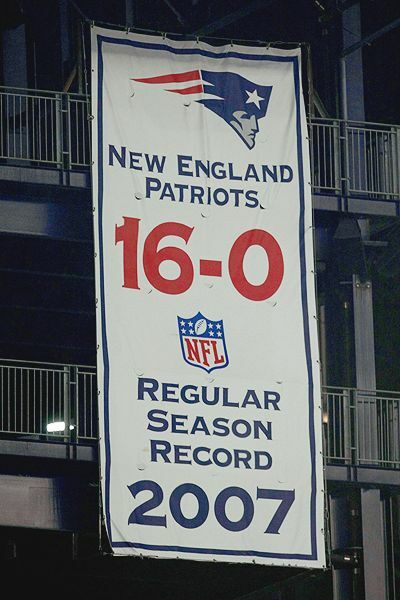 Fun fact(s): The Saints now have better banners to raise. And, apparently, not a moment too soon. Lameness quotient: Moderate. The Pirates won championships at Three Rivers, but did anyone actually lament the passing of a soulless, obsolete, concrete cookie-cutter monstrosity housing notoriously patchy artificial turf? 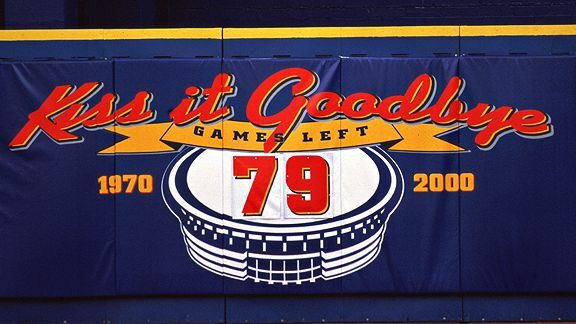 Fun fact(s): (1) Banner in question surprisingly did not refer to home team's athletic relevance, which already was eight years gone; (2) literally kissing Three Rivers goodbye likely would result in the acquisition of a communicable disease. Location: Memorial Coliseum, Lexington, Ky.
Lameness quotient: Moderate. 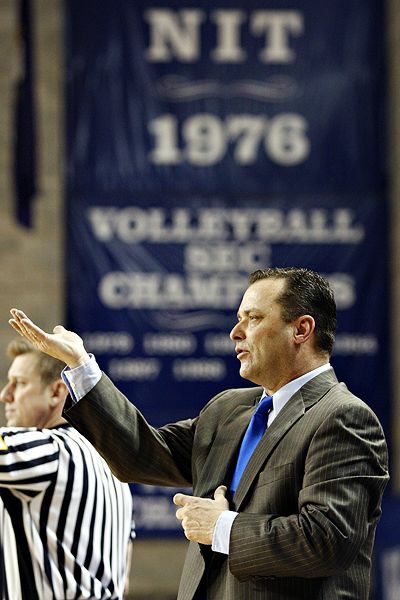 The Wildcats had the good sense not to hang said banner in Rupp Arena, where the men's basketball team usually plays its home games. Nevertheless, the winningest program in NCAA hoops history shouldn't need to display a 1976 NIT banner anywhere, any more than Magic Johnson needs a trophy case for participating in MTV's Rock 'N' Jock basketball games. 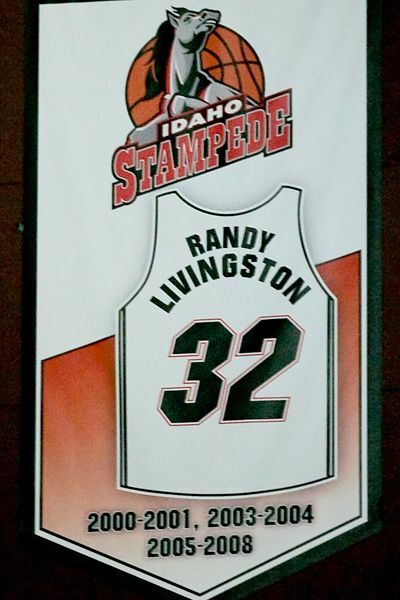 Honors: Randy Livingston, who played for the Stampede for five years, won the 2006-07 D-League MVP award, holds the single-game D-League assists record (22) and helped lead the team to the 2008 D-League title. Fun fact(s): Although Livingston is now retired, the D-League's Erie BayHawks still selected him in a recent expansion draft. How could they resist? Location: Gillette Stadium, Foxborough, Mass. Lameness quotient: Off the charts. See Tyree, David. Fun fact(s): Somewhere, Mercury Morris just giggled. • Click here to join Page 2's Bogus Banners group and upload your lame banner photos. Patrick Hruby is a freelance writer and ESPN.com contributor. Contact him at PatrickHruby.net.